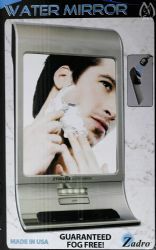 Use when shaving and grooming in the shower for a steam-free view. This fogless mirror has 4 bright white LED lights to illuminate your face. Includes a 3-hole razor/accessory holder and mounts to any smooth surface via suction cups, silicone adhesive or double-sided tape (included). Three AA batteries needed for lighting, not included.